Metal maniacs, rejoice! 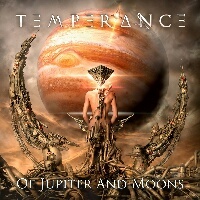 I am proud to present to you: TEMPERANCE; signed via Scarlet Records, hailing from Italian grounds - performing Melodic Heavy Metal, on their 4th album entitled: “Of Jupiter And Moons” (released April 20th, 2018). Since formation in 2013; the quintet in question have 3 albums behind them, I am introduced to their 4th album entitled: “Of Jupiter And Moons”. 10 tracks ranging at around 46:46, TEMPERANCE arrange an intricately designed formula of Melodic Heavy Metal developments. Starting off with “The Last Hope In A World Of Hopes” (bit of a mouthful, “The Last Hope” would have been justifiable) the band truly deliver a melodious distinction that has an uproar of battering instrumentation and epic synthesizer stability in which is balanced with dynamic pianist proficiencies - also featuring female-fronted vocalization which demonstrates the band’s diverse variety in musicianship adroitness. Is it good though, however? …that would be a resounding yes! Consisting of stunning Alessia on vocals; the front-woman showcases a complex execution of clean, high-pitched singing - contrasting with consistently rhythmic ramifications. “Broken Promises” distributes diligent creativity and elegant songwriting skills, Michele on vocals and piano provides a grandiose manifestation of unprecedented elements which have an organic aesthetic of fluidly polished substance. The titular track & “Everything That I Am” establishes hammering electricity and thunder; with the concrete solidity of Marco on lead guitars and vocals, who attributes with hard-hitting dexterity and efficiently bouncy riffs and solos - also dominating with gritty heaviness, thumping with extreme power. “We Are Free” implements the exquisite craftsmanship inventiveness; with anthemic singalong delights, and a amplified assault from powerhouse bassist Luca - who has a frenzied onslaught of audible energy and pulverization pummelling. “Alive Again” embellishes on catchy grooviness and jumpy orchestration nimbleness, rapidly swifting with an ominium gatherum of efficiently excelling composing eminence. Alfonso on drums crushes his steel with stunning flamboyancy, almost thrashing away with speedy velocity. “The Art Of Believing” is a noteworthy track, including beautiful violin performances (whose identity is unknown) and a vast amount unparrelled components which makes this release very special so far. “Way Back Home” contributes with more progressive technicalities, impressively producing enlightening fulfilment and an incredibly captivating experience. “Empires And Men” has similar characteristics, efficaciously frolicking with rampaging virtuoso. Overall concluding the record with the monumental finale track: “Daruma’s Eyes (Part 1)”; I was very impressed with “Of Jupiter And Moons”, the incredible complexity and meticulous design here is simply remarkable. Not a bad track on the record; everything is an enjoyable work of art, and TEMPERANCE certainly outdone themselves with this one. Definitely worth the money and time, pretty much masterful.